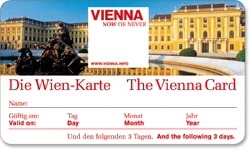 Like all major cities Vienna offers a discount card to all visitors to help the budget conscious traveller. The Vienna Card costs €19.90. It lasts for 72 hours and it entitles you to more than 200 discounts across the city. The major discount would be the free travel on public transport for the 72 hour period. You are also entitled to discounts on major museums and attractions such as the Hofburg and Schonbrunn Palace. However, the discount is only between 10-20%. You also receive discounts for restaurants and shopping up to 20%. The problem with the Vienna Card is that to get value out of it you will have to cram a lot in the 72 hours. Especially with the museums. You could end up running through and not really appreciating the exhibits. This could lead to a case of museum fatigue. Personally I like to take my time when visiting museums and art galleries to take everything in. Also most museums and galleries are only open from 9-5. To get the most out of the card I suggest that you carefully plan your 72 hours and stick to that plan. Otherwise if you want to take your time and visit the occasional museum but still want to take advantage of free travel then I would recommend that you purchase a 72 hour public transport ticket. This currently costs €14.50. In short I felt that the Vienna Card will represent value with planning but it may not suit everybody including myself.